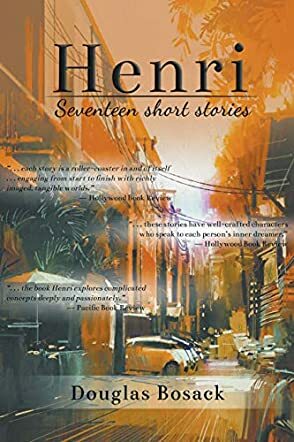 Henri by Douglas Bosack is a collection of short stories which also includes two chapters from another of the author’s books, Caduceus. They range in length and subject matter from quite brief as in the case of ‘The Short Order Cook’ (don’t read this one if you are planning a takeaway), to longer tales such as ‘An Observation on Self Esteem’ - a disturbing story of how a weak, insecure individual, who finds it impossible to stop the abuses of his military commander, manages to redeem himself. Themes of redemption and rehabilitation seem to feature strongly in the various narratives and there are some dark tales, ‘The Ceiling Fan’ and ‘Great Lakes Plaza’ among them. But there are also more light-hearted looks at life as in ‘Basement Monsters,’ where we discover the reality behind that spooky feeling that you get when you turn out the light, and ‘Einstein Was Right’, a sideways look at how we tend to judge others. Henri, however, must remain the star of the show but I am not going to say too much about this charming tale for fear of spoiling it. I found Douglas Bosack’s book of short stories a good mix of characters and situations. The tales, some harrowing, some light-hearted, some scary, are well written and peopled with well-drawn, solid characters. The title story, Henri, was a delight and I imagine it would be the sort of thing that could be made into a movie. I have to admit that I found ‘An Observation on Self Esteem’ disturbing. I sincerely hope there are not too many of those types of individuals around in the military, though I suspect they must exist. Henri is a laudable collection of yarns from a talented author and highly recommended. A creditable collection of tales which will not disappoint.